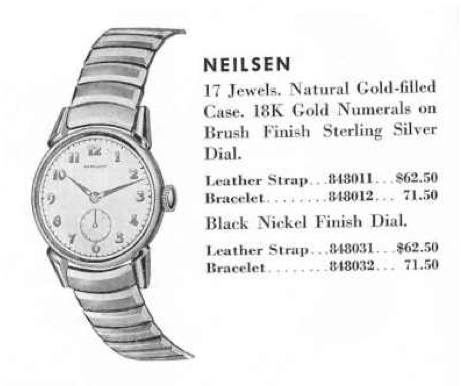 In 1953 Hamilton introduced the Neilsen. At 29mm wide, it's a larger watch by vintage standards and marked the end of the really small vintage watch era and the beginning of the still-kind-of-small-but-getting-bigger era. The Neilsen was made for only two years. 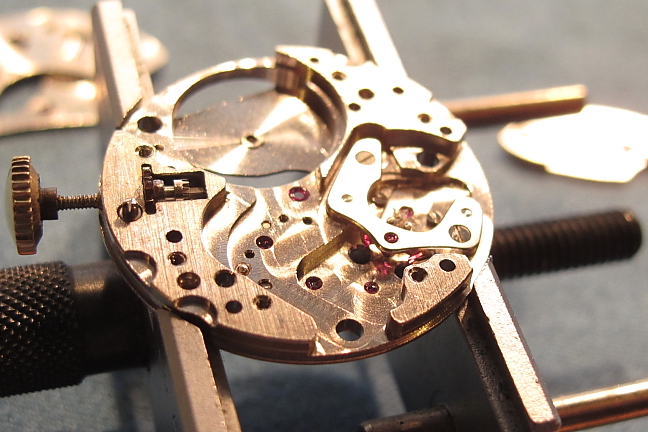 The Neilsen utilizes the 17 jewel 8/0 sized 747 movement. The case is 10K gold filled and the only dial option is a butler-finished sterling silver dial with applied gold numerals. 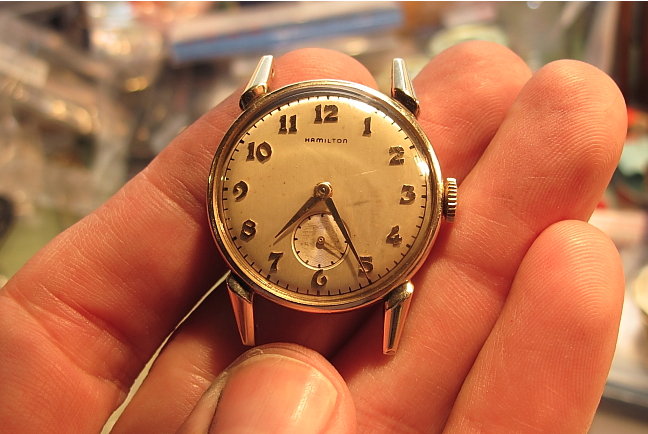 Here's an example of a Neilsen that I recently overhauled. As received, it's in pretty nice shape. It has a glass crystal with some small scratches. I'll have to purchase a replacement, as you can't buff out scratches from glass. The dial is a little dirty but not too bad. I forget for they call the green funk that you often find on gold filled cases but it is definitely going to have to go. 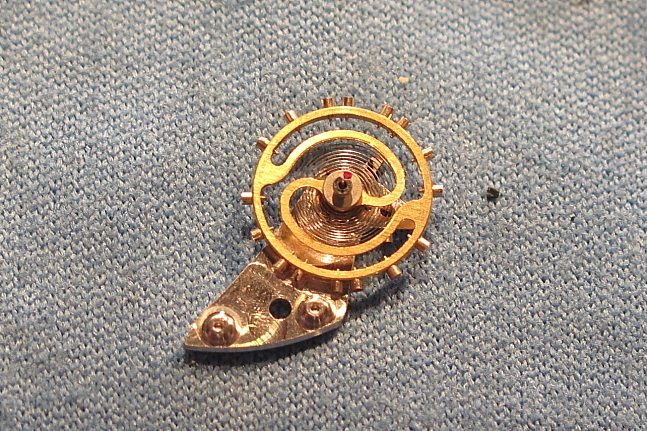 The back of the movement shows off the nicely damascened details. I really like the 747 movement - it's a clean, straightforward, classic design. 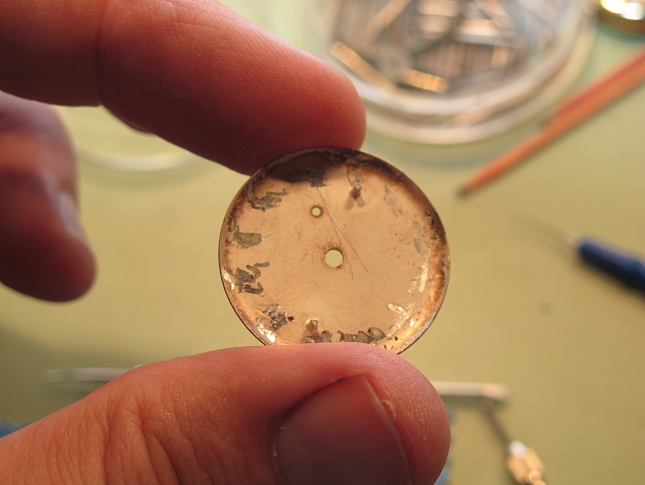 The back of the dial is unmarked - the scratches around the perimeter are from the riveting process for the 18K applied numeral. 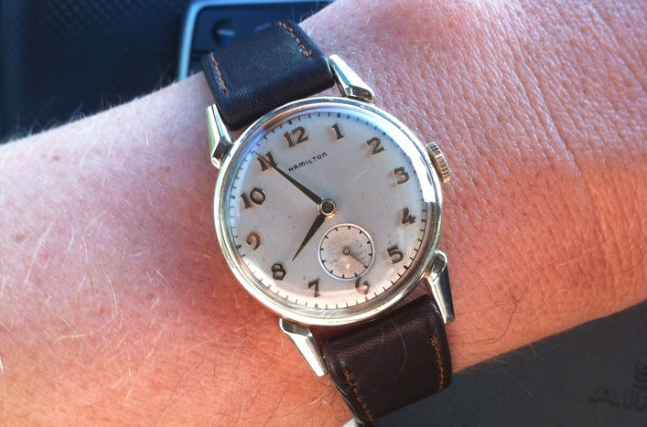 This has all the indications of an original dial. 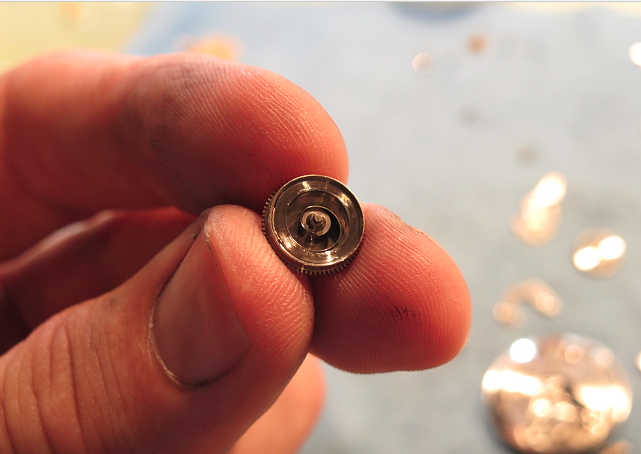 A nice fresh white alloy mainspring with a little grease will give this watch about 40 hours of life on a full wind. I still need to put the cover on the mainspring barrel though - but this view shows you the spring and arbor that will wind it. The first part back onto the cleaned movement is the pallet fork, sometimes called the anchor. You can see the little red pallet jewels sparkling. Next in is the escape wheel which engages the pallet fork and the fourth wheel. The portion of the fourth wheel that is down in this picture (ie not showing) is the second hand bit that the second hand attaches to. The thing I like about the 747 is the wheels are very easy to line up so the train bridge can be reinstalled. Everything but the balance is back on. So now I give the crown a few turns to make sure the mainspring engages and generates power through the gear train. If the pallet fork was not installed all the wheels would simply spin until the power was released. The balance on this particular movement was probably replaced, as this type of wheel I think was made later on. The original probably suffered a mishap and a complete balance assembly was installed in it's place. The little red spot is the impulse jewel. It engages the pallet fork as the balance swings back and forth, each swing moves the pallet fork and allows the wheels to turn one increment... 5 times a second. With the watch now running and ticking away, it goes onto the watch timer. 9 seconds fast per day, that's pretty good. 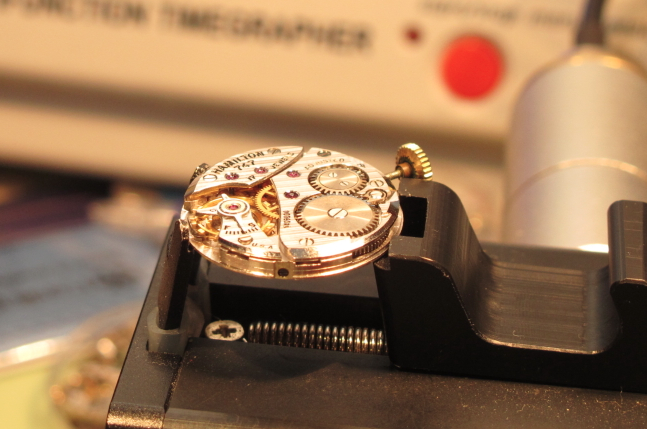 A slight tweak to the regulator to lengthen the hairspring ever-so-slightly will slow it down. 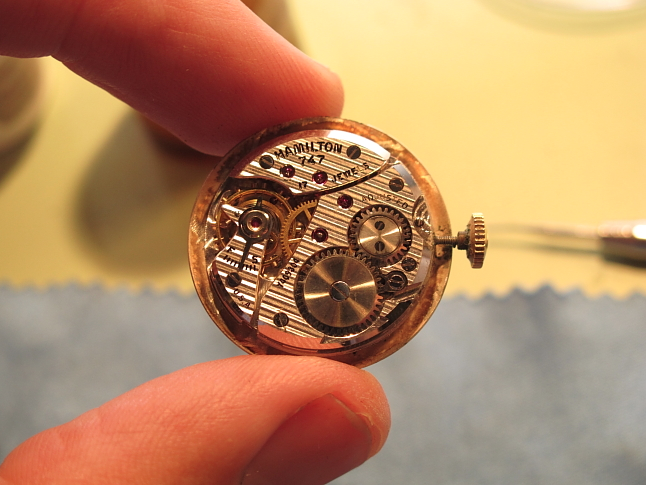 And here is the completed reassembly, ready for a strap and a new glass crystal. I happened upon a Neilsen that came with it's original inner and outer box as well as bracelet... sweet! I am looking forward to receiving this watch. I really like your new blog. Well then you're going to really enjoy your walk to the mailbox today... Thanks again! I have a Hamilton 747 that has not been used in over 40 years. Wanted to know what year it was made and stumbled across your blog. I noticed that is has factory engraves and human engraves and was hoping to get some feedback as to whom it belonged to . 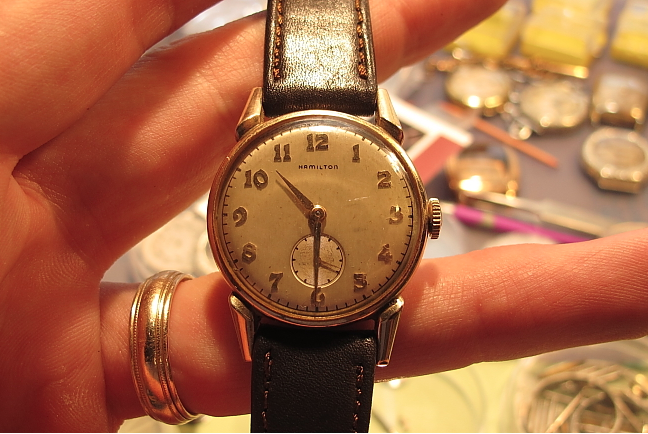 The factory engraves also include Y9061...17 jewels...adjusted...and the letter "J" on a dial and all of this was on the section of the watch that has all the gadgets spinning around and what not. Now here is were it gets interesting.On the inside of the housing , not only does it have the common "Clinton Hamilton W Co Lancaster PA it also has ( and please explain what this means as well ) K249391... Actually, here are the human engravings that have got me exited wanting to gather more info as to whom it once belonged...W9616 ( right above it appears to be 11 or possibly romans for 2 ) ...... Then there is B4797 and a letter M with the letter S directly underneath ( these are the initials I thing )then right after the M is... Scratch that and picture this... M6.70.41 with an " S " under the M... Also the 1 does not line up with the 4 it kinda looks like a " mark.... last it appears to CLN as another name I am guessing . Sorry for such a long post, this is my very first blog so if I did something wrong then I apologize ahead of time. Thanks again. 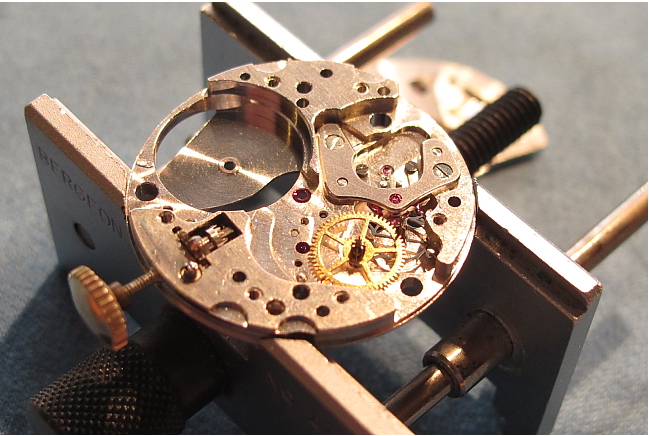 The Y9061 is the movement serial number and dates the watch movement to 1947. The K249931 is probably the case serial number and that doesn't really mean anything. 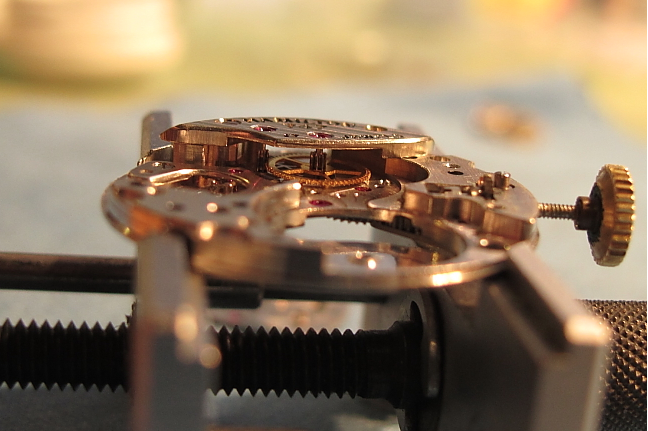 The rest of the engravings sound personal-related and specific to that watch. Without a photo of it, I can't offer much else. You've said in other posts that the 747 movement is very simple, easy, and a great beginning watch. 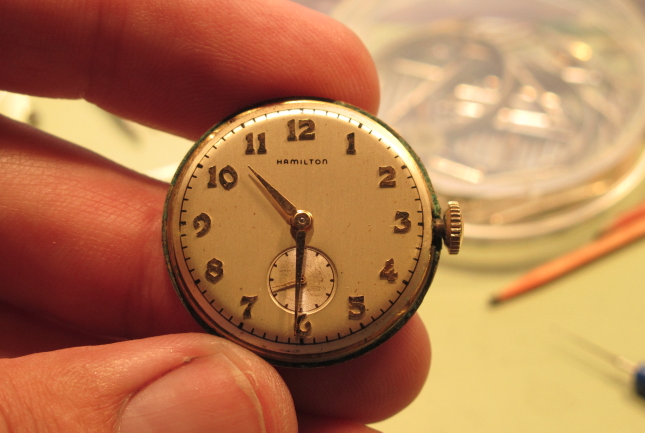 A couple of months ago two pocket watches were given to me. A side-winding 926 and a 992. I'd like to gain experience to fix a couple Hamiltons. How did you learn to do these overhauls and restorations? What did you do to gain experience when you were first starting? 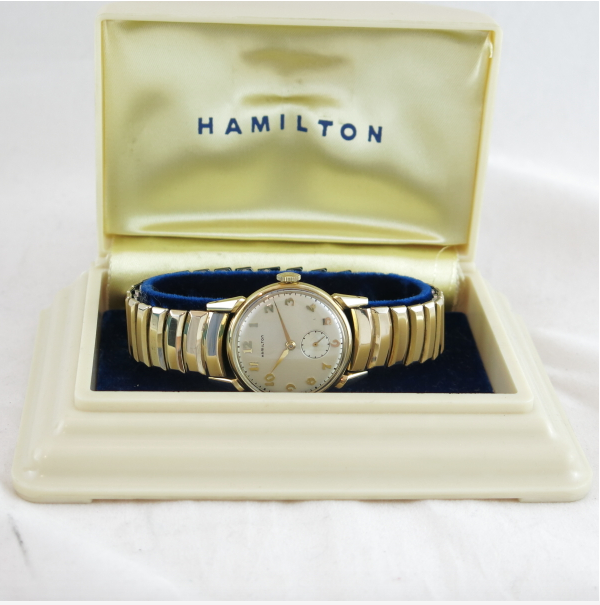 As well, is the 747 a good starting point to learn how to repair Hamilton watches? 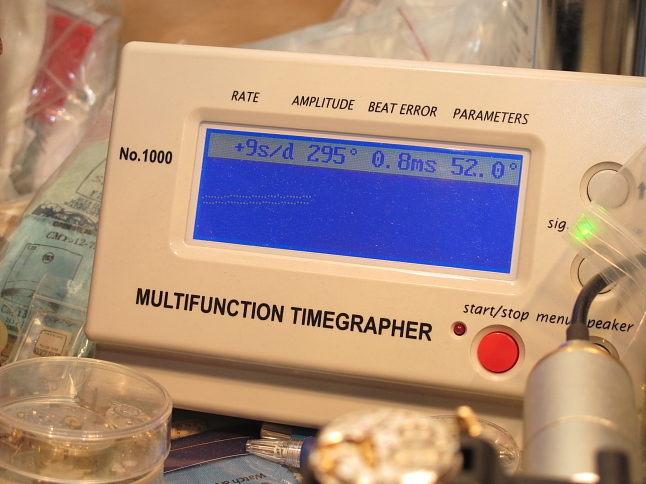 Read watch repair books, watch videos and practice. 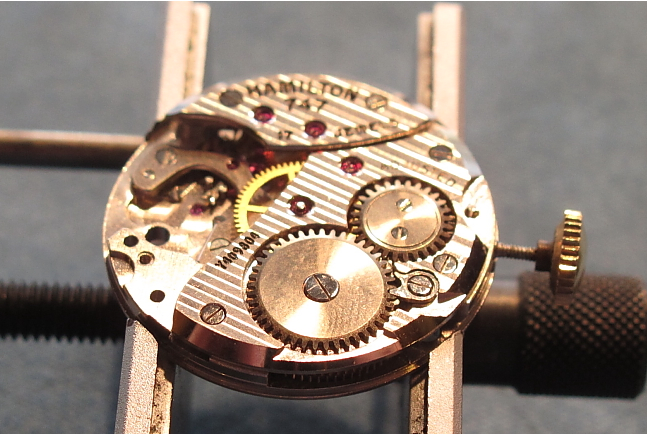 Understand and respect that true watchmaker go to school for upwards of two years, so it's not easy to learn this craft on your own. Plus the tools required are quite expensive. True indeed. Bergeon is a great quality brand, but they are terribly expensive. Even some of the generic Esslinger tools are expensive. Anyway, you do great work, and I love your website and your Etsy page. Thanks for the information!